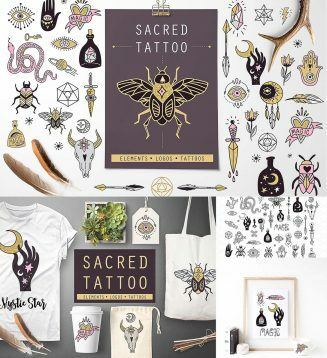 Introducing sacred, mystic tattoo hand drawn vector collection (38 illustrations). Perfect for any design projects: temporary tattoos, stickers, apparel design, cards, wedding invitations, greeting cards, packaging design, logos, photos, posters, bags, quotes, blogs, website, banners and more. Tags: arrow, boho, bug, mystic, native, sacred, taro, tattoo, tribal.